The Sultan Ahmet Camii, also known as the “Blue Mosque,” is located southwest of the Hagia Sophia. It was built on the grounds of the old Byzantine Palace to the east of the Hippodrome by Sultan Ahmet I. It was completed in 1616 and is one of the main mosques (Turkish = “Camii”) of Istanbul. 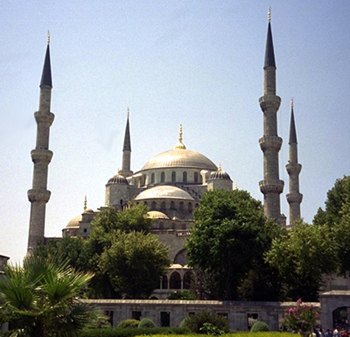 It is called the “Blue Mosque” because of the blue tiles that grace the interior walls of the structure. Because of the Moslem prohibition against images, the tiles are of geometric patterns and of lilies, carnations, tulips, roses, and a variety of trees. They were produced by the famous ceramicists of the Turkish city of Iznik and give a blue hue to the interior of the mosque. For about 250 years after its construction the sultans that ruled the Ottoman Empire from the Topkapi Palace attended Friday prayers here.